The past fifteen years has seen the United States and its allies engage in numerous military invasions and interventions in the Middle East. All of these operations have utilized strike aircraft, special operations forces and armed and unarmed UAVs as force multipliers. Warships that can provide a platform to transport and support small, combined arms units of strike aircraft, helicopter assault or amphibious assault infantry or marines, special operations units, and reconnaissance and attack UAVs are seen as an essential tool in prosecuting the low intensity conflicts of the future. Almost every nation with a maritime border and a viable navy on the globe has taken notice of these developments. These Multi-role Naval Platforms or MRNPs, come in a number of different designs. Some of these designs optimize flexibility and provide a balance of command and control, strike aircraft, air and amphibious assault, or cargo space while others are designed to maximize the effect of only one or two of these capabilities. The LHD is the most balanced, and thus flexible of all of the MRNP designs. The LHD is the largest design, requiring the dimensions and space to accommodate a large number of aircraft, troops, light and heavy vehicles, cargo and amphibious assault craft. The LPD is a well-balanced multirole vessel; however, on a smaller scale than the LHD. It has comparable flexibility, but at a much smaller scale it lacks the power projection capability of the LHD. Although their smaller size limits the scope of their operations, they gain the benefit of being able to operate more easily in littoral waters and are less costly to build and maintain. The DDH is a relatively new adaptation of the MRNP. The DDH abandons all amphibious capabilities in favor of aircraft assault and aerial strike capability. The only two nations to build and operate DDHs are the United States and Japan. The JMSDF operates three DDHs currently, with a fourth vessel to enter operation in 2016. It is obvious to see the benefits of these multirole vessels with their inherent flexibility, humanitarian support and power projection capabilities. The benefits are obvious, but why are so many vessels now being built in such a short span of time? These naval building programs are being driven by geo-political developments in two main regions of the globe, the Mediterranean and the Asia-Pacific. This is in direct relation to the wars of regime-change and disruption in the Middle East and the U.S. “Pivot to Asia” and the disputes over contested areas in the East and South China Seas. Although Russia was denied the two Mistral Class vessels, Vladivostok and Sevastopol when France reneged on the deal in 2014, Russia immediately made it clear that it will acquire indigenously designed and built vessels of similar pattern. These vessels would have proven of decisive value in supporting the Russian intervention in Syria. The two vessels were instead sold to Egypt. It is yet unclear how Egypt will employ these vessels in the future, but may aim to use them in bolstering the Saudi led military intervention in Yemen. Turkey entered into a contract with DCNS to build an LPD based on the Juan Carlos I LHD pattern in the summer of 2015. The accelerating acquisition of MRNPs in the East and South East Asia regions is the most alarming. With China, Japan, Indonesia, Malaysia, the Philippines, Australia and the United States all rapidly building and commissioning these vessels in high numbers over the past ten years, it could reasonably be said that there is a naval arms race occurring in proportion to developments related to the South China Sea Crisis. China has built four Type 071 LPDs of a total of six planned vessels, and has designed LHDs that have a displacement of 40,000 tons. 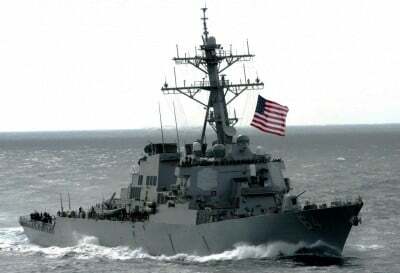 Other claimants to disputed islands and waters in the South China Sea have been encouraged and supported by the United States in their efforts to acquire LPDs to back up their territorial claims with naval power. As the United States accuses China of engaging in a massive military build-up, it must be noted that the United States operates more of these multi-role vessels than all of the major world navies combined. As the crises in the Middle East and East China and South China Seas continue to escalate, it is increasingly probable that those nations involved will decide to use these newly acquired vessels for the purposes of power projection, deterrence or in response to military provocation. Considering the increasing brinkmanship and saber-rattling between the United States and China, the irresponsible and destabilizing military actions of Turkey against its neighbors, and the recklessness of the Saudi-led coalition in Yemen, the odds that these powerful new naval tools will be used increases with each passing day.